More than a century old, the Indian Institute of Science at Bangalore is acknowledged as one of the top research institutes in the country. The institute was established in 1909 and was the brainchild of well known industrialist Jamsetji Tata. One of the joys of studying at the Indian Institute of Science is definitely its sprawling campus. It extends to over 400 acres and is an oasis of green. The campus is located about 4 kilometers away from the railway station in North Bangalore and is extremely self sufficient. There are shopping centers, restaurants, play grounds, beauty saloons and a gym. There are also several hostels for the students as well as six canteens. What’s on offer at IISc.? The institute has also announced the launch of undergraduate programs with a four-year BS degree. The subjects on offer for students include Biology, Chemistry, Environmental Sciences, Materials, Mathematics and Physics. The undergraduate programs are designed to be liberal in nature and students taking the above subjects will also have to take courses in engineering and humanities. The institute has six divisions or centers and over 40 departments. These are Biological Sciences, Chemical Sciences, Electrical Sciences, Mathematical and Physical Sciences, Mechanical Sciences, Earth and Environmental Sciences. 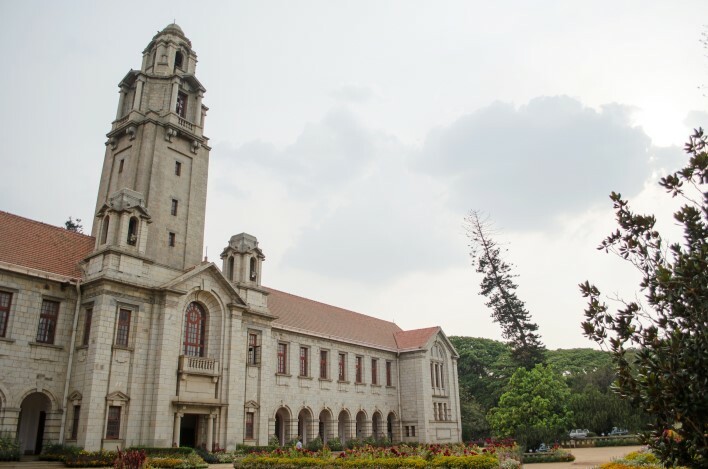 Research and Grants at IISc. The Indian Institute of Science has evolved as one of the top research centers in the country. The research departments in the institute are Supercomputer education and research center, Centre for Cryogenic Technology, the Centre for Excellence in Nano Electronics and Spectroscopy/Analytical Test Facility. The institute also has excellent links with industry and other universities in order to build up its research infrastructure and facilities. The institute works with government organizations like National Aerospace Labs, Bharat Electronics Pvt Ltd, ISRO and DRDO. IISc also works with private research centers and industry. The institute has associated with Center for Development of Advanced Technologies, General Motors, IBM Research and several other private concerns. Some of India’s top brains have either studied at the Indian Institute of Science or have been closely associated with it. Names like CV Raman, Homi Bhabha, Brahm Prakash, J C Ghosh, CNR Rao are just a few of the people who have either studied at the institute or have worked closely with it. In fact Dr C V Raman was the first Indian director of the institute. Dr Homi Bhabha worked at the Department of Physics at the Indian Institute of Science and then went on to set up the Tata Institute of Fundamental Research and Bhabha Atomic Research Centre. The founder of India’s space program, Dr Vikram Sarabhai was an alumnus of the institute. As per India Rankings of National Institutional Ranking Framework (NIRF) in 2016, 2017 and 2018, Indian Institute of Science was ranked as the best University in India for 3 years in a row!. Not a surprise to us at all, this is a well known fact for decades!